Daikon is so versatile and I love it so much. I simply tossed the ingredients in home-made ponzu. Mix the ingredients for ponzu sauce and set aside. 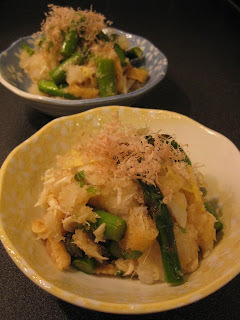 In a bowl, combine grated daikon, asparagus, abura-age, and crab meat with the ponzu.